This Saturday I landed my first Butte Creek steelhead. A nice 20'' fish on a 3wt. 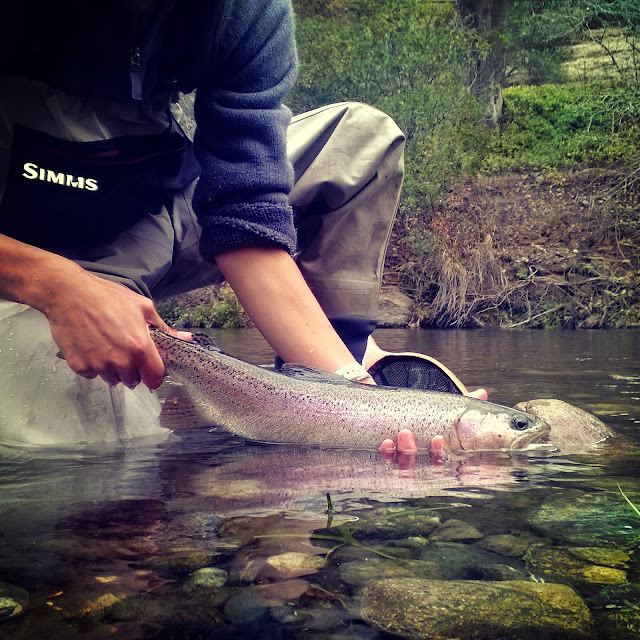 It just goes to show that there are steelhead that run through Butte Creek and if you work the river hard enough you just might strike silver. Steelhead can be very hard to find in this creek so I'm sure a lot of anglers who know where to look keep the locations top secret. This fish took a size 18 midge dropper that I tied on 4x tippet and would rush away as I approached her with my net. I played her carefully taking my time to get her in as soon as I could as well as trying not to break my light tippet. Several attempts later I felt the sweet and exciting achievement of landing my first Butte Creek steelhead. The flows are going up and down but should stabilize soon with all the on again off again rain. It should help bring in some more winter fish.